Top story on BBC online news, about young people’s project work at Thomas Hardye School. Young people will be presenting their findings back to an invited audience this coming Monday at 1.30 pm. If you would like to attend please get in touch. 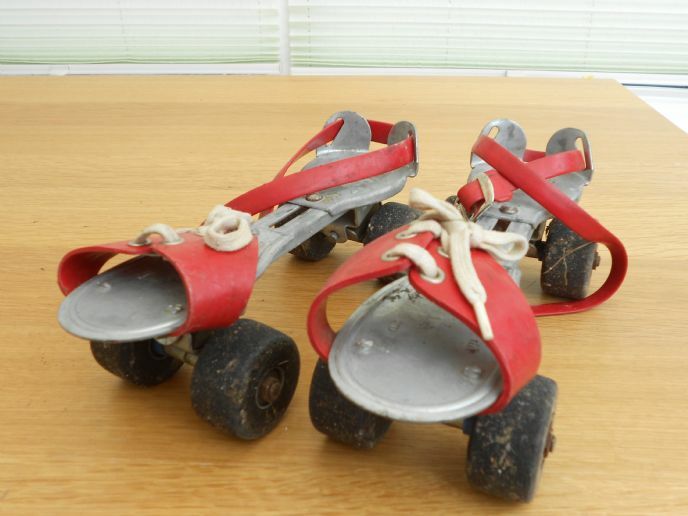 Rollerskates, a collection of Sindy dolls and Steiff soft toys, all from the 1960s, have already been uncovered during the scheme. Roller Skates fitted over your shoes. They were no where near as safe as those you would buy today. This pair are rather small and only fit up to about a size three or four shoe inside them even though they are adjustable. They are however, just as good as they were when they were new. About Sindy dolls (Sindy and Tressy) from the 1960s. The dolls in the pictures are all wearing their original clothes and the furniture is original too. The clothes that you could buy for these dolls were representative of the fashions at the time. Just like today, girls dressed their dolls and styled their hair to look like the people they saw around them. There was a Sindy club that you could join, and then receive items in the post. Tressy was a doll that had extendable hair that you could pull out of the centre of her head when you pushed a button on her stomach. You then used a key to turn a dial on her back to roll the hair back inside her head. Unfortunately, the hair (which would have looked like a ponytail) is missing on the doll in this photo. Tressy was available in blond and brown, and her hair could be extended to whatever length you wanted. The archive, which is being collated by pupils at Thomas Hardye School, Dorchester, will be stored at Dorset History Centre from December.